Exhibition season has started again for the entertainment industry with Europes' leading show happening in Frankfurt last week. As we're introduced to new products ourselves, we'll blog about the ones that we think will interest our customers too. To start the ball rolling there are two new Lighting controls newly launched that look set to change the way that folk look at "small" consoles and for controlling rigs with lots of LED's. First up is the new FLX (pronounced flex by some) from Zero88 - it's been in concept for several years but over the last few years it's development has really pushed forward so that Zero88 have a control purpose built for wholly LED lighting rigs. Being Zero88 it also has the flexibility to control generic dimmer channels as well moving heads. 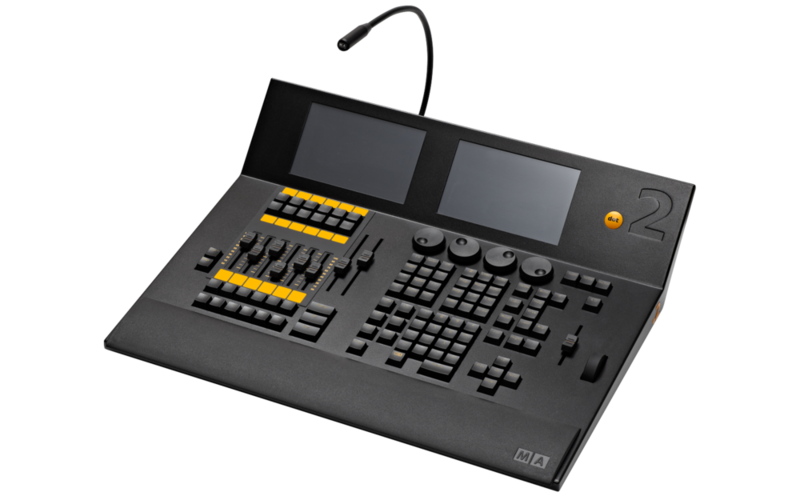 FLX has a touch screen set in to the front panel for enhancing the ability to control your desk and rig as well as featuring fader control over channels/fixtures and playback stacks. It's running ZerOS - as already runs on the Zero88 Solution and Orb series of desks but because FLX has a quad core ARM processor at it's heart there have been tweaks and enhancements that might work their way back in to the core ZerOS. The touch screen plays an active part in controlling your rig - if you have LED Colour changing fixtures then the screen presents a series of ready defined palettes with colour numbers matching your favourite gel brand. If you have a company logo or a projected backcloth that you want to match your rig colours to - then load a picture on to the desk, press the part of the picture with the colour you want and voila - FLX matches the colour values. FLX is expected to 'sit' alongside the Solution series (above the Jester but below Orb in the Zero88 range of controls) for those users & designers that know they're working with colour changing and moving fixtures (under test is a stage sizing routine that will offer easy touch access to positions on your performance space too) but don't need the channel faders that Solution offers. If you want more channel faders or more playback faders then FLX also has the ability connect accessory fader panels using USB - if you need a remote fader wing for the Stage Manager then a USB extender makes this possible too. Zero88 are already taking orders - the first production batch is almost spoken for - if you'd like to see one close to, then talk to our sales desk. The second console that's piqued our interest is the 'Dot2' from GrandMA - mainly because we never thought we'd be selling a GrandMA product but having seen an impromptu demo of the dot2 and being told it's price - we think there's a strong chance we might end up actually selling some! It's about the same size as the FLX so is portable and has two touch screens built in for helping to control it and a multitude of connection options for DMX and DMX over ethernet. More impressive is that the console comes bundled with a 3D visualizer package and PC backup software, so that you end up with a very impressive high end lighting console for not a great deal of money (the price point hasn't been announced yet but the hints are that it might sit around the price of ETC Ion). From the brief demo we saw, it's equally at home controlling generic dimmers as well as fixtures and a lot of thought has gone in to ensuring the user doesn't have to learn new syntax or workflows to access either type.You can see more about 'Dot2' on it's own website Here and again if you'd like a demo, then please give our sales desk a call. There's undoubtedly more new products due to be shown to us over the coming weeks - EMD Stagg, ProLight are two for certain. As we hear more, we'll write another article here.